Anyone who knows me knows that I have a penchant for DIY projects. I blame Pinterest. Since discovering this evil genius website I have spent countless hours grating bars of soap for homemade laundry detergent, melting beeswax and coconut oil for face wash, and dehydrating my own chili peppers to make my own taco seasoning. Well, the clothes never did quite smell clean and after several months I resorted to buying the overpriced chemical filled detergent again. I suffered through weeks of breakouts akin to being a 13 year old girl going through puberty after the coconut oil proved too greasy for my skin type. And the chili peppers? Well, that’s a story that warrants a little detail. I got a dehydrator for Christmas and was thrilled to begin dehydrating anything and everything in my house. I made my own fruit leather, dried onions, mushrooms, chili peppers, and strawberries. Basically anything that didn’t move quickly enough to get away from me spent 48 hours in the dryer. I stored my wares in mason jars in my spice cabinet and would often just stare at the shelf in awe of my Martha Stewart-ness. It made me happy to see jars and jars of fruits and vegetables neatly lining the shelf. Today I decided to make chili for dinner. I have a slammin’ recipe for the best chili you’ll ever taste (posted below). Instead of using the store bought MSG-filled crap at the store I thought it the perfect opportunity to use my dehydrated chili peppers. I pulled out the mason jar and began digging the seeds out of the peppers. It was quite easy and they simply just crumbled away after I jammed my finger into the end of the chili. I place the empty pods into my Ninja and was getting ready to grind them up. The kids were all happily eating their lunch and the ground beef was almost done. I patted myself proudly on the back at having everything “so together” in my house. About this time my husband disappeared into the bathroom. Now I’m not trying to say he spends too much time in the bathroom (but seriously what could possibly take that long?). All I’m saying is that what transpired while he was locked in there was a comedy of errors. I placed the last of the pepper pods into the blender and as I was getting the blender ready and stirring the meat once more my left eye began to itch. Naturally, I stuck my finger directly into my eye to scratch it. I didn’t feel anything at first and I went about my business. Then my eye began to tingle just a bit. Again, naturally, I wiped at it with my left hand. This was the same hand, I might add, that I had used to de-seed the peppers. Before I knew it the tingling had turned into a burning sensation. The fire seemed to creep from the corner of my eye quickly covering the entire lid. My eye began to water and at once I knew what I had done. I ran to the sink and splashed cold water in my eye. Well this just seemed to “activate” the pepper and a blinding pain seared through my retina. I was sure I was going blind. I fumbled around trying to find something, anything to stop the pain. I stumbled over to the freezer and half blind dug through it until I found a Spider man ice pack. This provided little relief. It was about this time the kids finished eating and were running wildly through the house chasing the dogs. The baby, still strapped into his high chair, began to get restless hurling his plate across the room and screaming. I ran to the bathroom door. “HONEY!! HOW LONG ARE YOU GONNA BE IN THERE?” I screamed in desperation. The pain kicked up a notch and I couldn’t even stay to answer. I was certain blood was oozing from my eye socket. I ran to the bathroom trying to squeeze my face under the faucet the ice cold water running down my face. At some point the pain reached a new level and I screamed out in pain. I was trying to calculate how long it would take to get to Urgent Care and if I could leave the running water long enough to make it there without gauging my eye out. I began taking a mental inventory of all the painkillers we have leftover in the house and wondering if any of them could even touch this level of pain. I managed to fumble for my phone and with half my head in the sink under the running water and half blind I searched “chili pepper in eye”. A blog popped up that said to do a milk wash to neutralize the pepper. I ran back in the the kitchen. The dogs and children swirling around my feet as I blindly fought the child locks on the cabinet. I managed to get a Santa cup, fill it with milk and ran back into my bathroom. I was pouring milk all over my eye, my face, my chin, and my brand new shirt when I finally got some reprieve. The pain all but stopped for a few seconds. But as soon as the milk dried it revved back up again. Over and over desperately splashing and pouring cup after cup of milk into my eye. With each cup it seemed to get a little bit better. I figured out I could tightly press the cup against my eye and tilt my head back so that I could let the milk just sort of sit on the burn. I positioned a hand towel under the cup to catch the stray streams dripping down my face. It was then that my husband walked into the bathroom. WIthout blinking an eye he said “Ohhhhhhh, you got chili pepper in your eye huh? That burns like hell doesn’t it?” And promptly turned and walked out of the room leaving me to my own devices. After another 10 or so milk baths the pain subsided enough that I could return to the kitchen and get the pan (now full of burnt ground beef) off the burner. And now, an hour after the incident I am sitting here still in shock my face sticky with dried milk telling you this story. 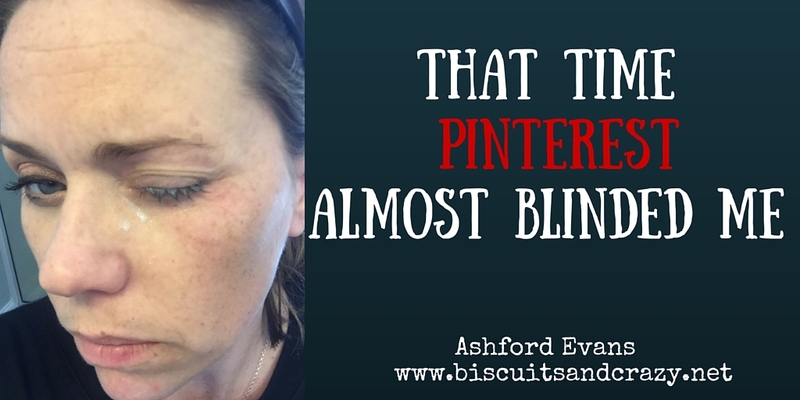 In closing I’d like to leave you with a warning about the dangers of Pinterest. Do not forget the day I almost lost my sight in the name of DIY seasonings. And be careful what you pin. This is slap yo mama chili! This recipe yields enough to eat for a few days and to freeze for later. Brown the ground beef and onions. Dump all ingredients into a slow cooker or a dutch oven and simmer on low 3-4 hours. I am sorry but I could not help but laugh, especially at David. My husband had been buying these jalapeño poppers at the grocery store for some ridiculous price. I told him to cut it out and I would make them for him. The first time, I just burned my hands. The second time I inhaled the damn things and almost threw up all over the kitchen. Now just the smell of them reactivates my response and I have to leave the house. Now my husband has permission to buy them pre-made, but he has to make them when I’m not home!